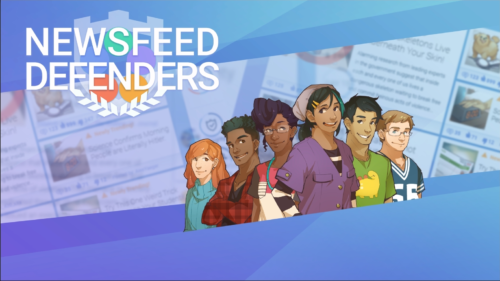 The Annenberg Public Policy Center, home of FactCheck.org and Annenberg Classroom, and iCivics, the education nonprofit founded by Sandra Day O’Connor, have released NewsFeed Defenders, a new online game designed to teach media literacy and help students and adults better understand what news is and how to avoid being deceived by misinformation. 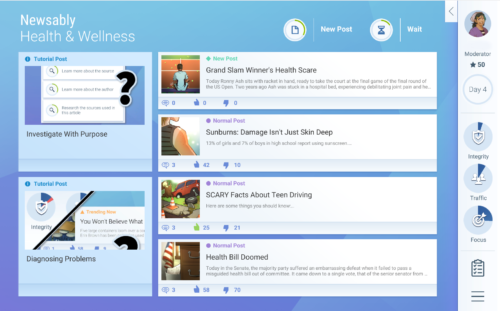 The game gives players a look behind the headlines by teaching them how to spot so-called fake news, or viral deception; how to know when advertising is posing as news; how to identify bias in stories based on word choices and how a story is framed; how to apply journalistic standards, verifying information and images; and how to become a more astute reader of online news. Is that story about free tuition true? Players choose the focus of their Newsably feed: Student Life, Health & Wellness, or Sports & Entertainment. They rise through the ranks at Newsably from guest member to full community curator. Each day brings a new challenge: Should players report as a violation that fishy post about free tuition for all? Post an article about Bat Boy at Burning Man even if their newsfeed is supposed to be about Student Life? Place a trending post on the latest pop album release in Newsably’s feature spot? Or should players investigate the viral post about arrests at polling places to make sure it’s accurate? 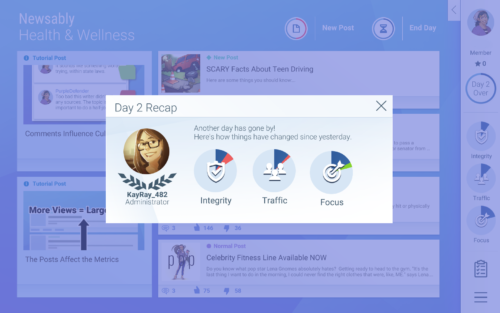 In addition to juggling member traffic and maintaining community focus, players must ensure that the content they post is, in fact, news. That means learning to tell when posts are actually ads disguised as feature stories or viral rumors presented as news. So, even though that headline about the President adopting an alien child might catch eyes, players don’t want to post that story — if they want to maintain a credible news site. Players can investigate each story for reliable content, check the veracity of facts, and determine the trustworthiness of the originating source, earning points for judging accuracy, transparency, trustworthiness, and impartiality. Correctly flagging problematic posts removes the content that does not belong and allows the players to explain why. iCivics is the country’s largest provider of civic educational material and has created 20 games and hundreds of lesson plans to teach K-12 students the fundamentals of American democracy by using simulations to give students a first-person point of view on crucial topics such as elections, the roles of the executive branch, and the courts. Its games, which are completely nonpartisan, are available for free at iCivics.org. The Annenberg Public Policy Center’s project FactCheck.org has spent 15 years fact-checking politicians’ claims and viral misinformation. Another of its projects, Annenberg Classroom, provides teachers and classes with a free, comprehensive multimedia curriculum for teaching the Constitution. NewsFeed Defenders is available free on the web at FactCheck.org and at iCivics and as an app for tablets through iTunes and Google Play. Founded in 2009, iCivics is a nonprofit organization committed to transforming civic learning through effective and inventive resources. iCivics was founded by Justice Sandra Day O’Connor to develop free educational online games and lessons that teach young Americans to be knowledgeable, curious, and engaged in civic life. iCivics’ game-centered curriculum provides students in grades 4-12 with the tools they need for active participation and democratic action. Today iCivics’ innovative resources are used by nearly 180,000 educators and more than 5 million students nationwide, making iCivics the largest classroom-based digital civics educational resource in the country. For more information, visit www.icivics.org. Founded in 1993, the Annenberg Public Policy Center (APPC) of the University of Pennsylvania is the home of FactCheck.org and Annenberg Classroom, which are dedicated to enhancing media literacy and civic knowledge. FactCheck.org is a nonpartisan, nonprofit consumer advocate for voters that aims to reduce the level of deception and confusion in U.S. politics. It has published a video and article showing voters how to spot bogus claims in the news and on social media and has partnered with Facebook to identify and label false viral posts. Annenberg Classroom, a project of the Leonore Annenberg Institute for Civics, provides teachers with a free multimedia curriculum to teach the Constitution to middle and high school students. Its resources include games, timelines, lesson plans and videos, including a dozen award-winning films produced by the Sunnylands-APPC Constitution Project, whose advisors have included Justices Sandra Day O’Connor, Stephen Breyer, and Anthony Kennedy.